The Canadian Cancer Society has appointed its new President and CEO, Peter Goodhand, who replaced Dr. Barbara Whylie in that post on May 4th. How powerfully will Mr. Goodhand advocate for primary prevention – stopping cancer before it starts? Our in-depth interview with the new CCS CEO, who comes on the scene with a good reputation for prevention, is slated to appear in the next issue of An Ounce. As we have said before in this newsletter, CCS has moved ahead in heartening and sometimes surprising ways on the prevention front over the past 10 years (think of CCS’s stand against ‘ornamental’ pesticides, and its partnership in the Take Action on Toxics campaign in Ontario.) But there are still miles to go. Consider, for example, the question that Dr. Sandra Steingraber (author of Living Downstream) always asks, and we will too: Why do the words ‘carcinogen’ and ‘environment’ (or ‘occupation’) rarely appear together in cancer pamphlets in doctors’ offices? And if ‘cosmetic’ use of pesticides warrants action, why not agricultural chemicals – most of which are derived from dwindling supplies of toxic fossil fuels? One of the other questions we’ll ask is why the Canadian Cancer Society gives away cars (even if they are hybrids) and gift cards to Canadian Tire as prizes in its annual Quit Smoking Challenge called Driven To Quit. Why not ‘driven’ by a snazzy e-bike or the gas-miserly Rayben Retro scooter? Or a good old-fashioned two-wheeler that relies solely on human energy? Mr. Goodhand is at the left in this photo with Ontario’s Minister of Health Promotion Margarett Best, and – whoa! – our national enviro icon, David Suzuki, at the start of the 2008 Driven to Quit Challenge. Like the Cash & Cars Lotteries for Cancer, this sort of stuff drives us to distraction. 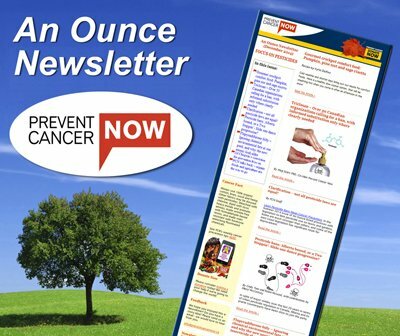 Join Prevent Cancer Now in Cyberspace! Consumer products: get the toxic chemicals out! Is Radon a risk in your home?